As part of our Women for the Land program, we invite local women landowners in Solano, Yolo, and Napa Counties to a conservation learning circle. Please note that you must register to attend. Women for the Land is a successful AFT program in the Midwest and Mid-Atlantic states that we have brought to California. 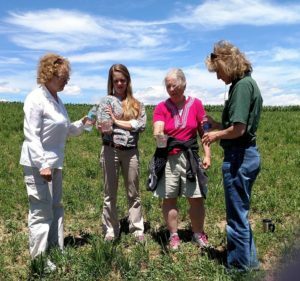 The program supports female landowners in accessing resources and building strong networks around conservation. Women for the Land focuses on women who already own/co-own or may soon be purchasing or inheriting agricultural land in California. Hosted in partnership with Solano Land Trust and NRCS, the topic of this learning circle is on whole farm conservation planning. During the learning circle, participants will meet and network with other women landowners, connect with local conservation agency staff, learn about creating a whole farm conservation plan, and tour a farm to see conservation practices at work.